Klaus Caprani's instruments. The equipment page. Here is the page for equipment freaks. As you can see there's a little of everything and it's almost all either build by myself or modified to my specifications (mainly by myself). In the "tower" to the left you can see my little Boss GE-21 equalizer on the top. It's not much that I use it as I mainly have it to compensate for acoustic problems in acousticly impossible venues (They're rather rare - fortunately!). In the 19" rack under the EQ you'll see a 250 W solid state bassamp, build by myself. It has a very simple layout with two band EQ, which can be bypassed (mostly it is). I use the pre-amp in this one, and the signal goes through line out, into the Boss EQ, and from there to the input of the Furman TX-3 active crossover, which is mounted below. From the crossover the lo-out (mostly under 300 Hz) goes back to the power amp. And the hi-out goes to the Yamaha B-100, which is seen under the rack. The Yamaha amp is somewhat tweaked as the standard issue doesn't offer much headroom. Under the Yamaha you can see my top cab, which is a doublechamber/ ported system with a 12" Jensen mounted in the ported part (port frequency 80 Hz) and a 10" Altec mounted in the closed part. Under that the sub-woofer is situated. This is a ported system (port frequency 40 Hz) with a 18" RCF PA woofer. 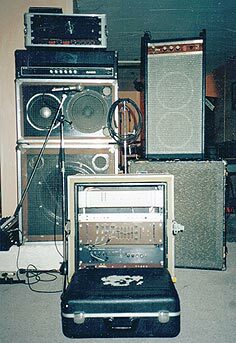 To the right, on top, you can see my Gibson Thor 40 W basscombo from '68, which is throughoutly restored and modified with standby switch and adjustable gain. That was a dire nessecity because the amp (at least for bass) was quite unusable relating to todays standards (due to lots of clipping). The speaker compartment has been ported and filled with a suitable amount of damping material. 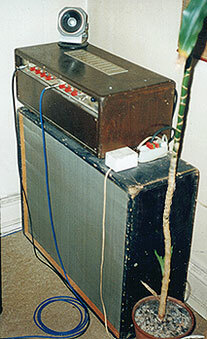 Because of those modifications the amp is now able to handle small gigs with excellence, and is even able to reproduce the deep B with great authority, provided the amp is located in a corner. Under the Gibson basscombo my old Ampeg V-4 cab with 4 x 12" Vintage Celestion Greenbacks can be seen. This cab is great for guitar and very Marshall-like. (No wonder - speakers are the same). First in the front is my cable and stomp box case and behind that an effect rack with reverb, phasers, envelope filter and more. This rack is not something that I drag along to venues anymore as it is quite heavy and takes up a lot of room for the relatively few effects that it contains. It should be said though, that especially the phasers are fantastic. This is a tube guitar amplifier which I've build based on an old Guyatone chassis that I was given once. It can best be described as a mixture of everything good (well - almost <g>) with inspirations from Marshall, Fender, Dumble, Boogie and more. The amplifier plays with the nicest, cleanest tone in the normal channel (something like Fender Twin) and has a killer distortion in the lead channel. The output transformer is calculated and wound by myself, in double size of the minimum requirements. Because of this the amplifier has great headroom and a deep lower frequency range. 2 x 12"cab which is fitted with a very old Philips guitarspeaker and a SEAS guitarspeaker that I upgraded with aluminium centerdome (like JBL). On top of the amp, in the corner, you'll see a little, adjustable mid/treble speaker which I use to compensate for the loss of treble that occurs when a speaker cab is positioned on the floor (and in a corner). 22. Tube-Tech CL 1B Compressor New! 23. Klark Teknik DN-22 graphic Equalizer New! 24. Neumann KM 84 electret microphone New! In honour of the passionate tube lovers, I listed the tube types of my amplifiers below.